Corra is pleased to announce the launch of a new elegant experience for Sheiban Jewelers on Magento Commerce 2.1. After a century-long tradition of purveying luxury brands such as Rolex, Tacori, and Verragio, Sheiban Jewelers sought to initiate an ecommerce presence that could attract visitors from well beyond its Ohio headquarters. Insights from our competitive research revealed that very few jewelry brands are selling engagement rings online while providing excellent customer service. The family-owned firm was challenged to effectively educate online customers and to segment them into a range of different buyer personas — everyone from first-time purchasers of engagement rings to loyal customers returning to invest in fine watches. Sheiban Jewelers’ goal was to translate its finely tuned in-store approach into a seamless online experience, guiding customers through their purchase journeys while ensuring the same high standards of service. Sheiban Jewelers chose Corra because of our deep experience in the luxury market and our elegant design aesthetic. Our first recommendation was to optimize extensive, eye-catching photography to portray the beautiful facets of stones and jewelry pieces. We also focused on creating highly functional menus that could effortlessly guide users of many different personas through their shopping experiences without overwhelming them with options. The result included multiple shopping paths that allow users to quickly find products based on criteria such as collection, price range, brand, and design. Engagement rings are, of course, a highly personal purchase, so Corra developed an interactive experience to design your own ring, allowing customers to control every aspect of the product. Based on a very complex data model, the feature allows to quickly display more than 450 custom ring iterations based on different metals, stones, cuts, colors, and ring sizes — each from a 360-degree perspective. Our research showed that most visitors looking to buy an engagement ring have little or no knowledge of what to look for in diamond quality, cut, or ring style. To simulate the assistance that customers receive in-store, product information, warranty, shipping details, and educational tips are readily available without the shopper having to interrupt the purchase journey. A summary of details and specs is provided for review before purchase, and brides-to-be can instantly share their ring of choice with others via social media. Integrations used to customize Sheiban’s new system included Avalara, Live Chat, MailChimp, Stamps.com, Xtento Feed, Klarna, and PayPal, with Klarna and PayPal both crucial to enabling Sheiban’s payment systems. Since launching in early August, Sheiban Jewelers has already seen a 37% jump in organic traffic to the site, and the company is ready for whatever their customers demand next. 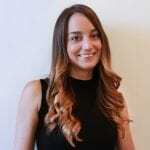 Erica Mazzucato is Communications Marketing Manager at Corra. Combining her passion for storytelling and graphic design, she manages the agency’s brand and content strategy.